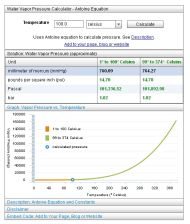 This calculator uses a fitted equation to calculate the saturated vapor pressure. Therefore, the calculated values should be considered approximate. The equation is has a valid range of 1°C to 374°C and 4.89 mmHg to 162991 mmHg. The constants for the Antoine formula are located below. This calculator uses the first set of constants for temperatures below 100° Celsius. The equation requires temperature to be in Celsius and pressure in mmHg. This calculator automatically makes the conversion. Water will boil when the atmospheric pressure is less than the vapor pressure for a given temperature. Internet application to solve for the vapor pressure of water. This includes a line graph of temperature versus pressure. 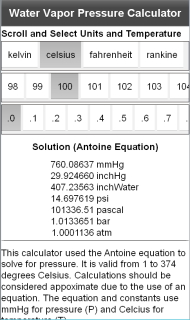 Get this calculator on your Android smart phone or tablet.